Associate Professor and Chair Sarah Perrier, Ph.D., is the author of two collections of poetry, Nothing Fatal (U of Akron P, 2010) and Just One of Those Things (Kent State UP, 2003). Her other publications include work in Best New Poets 2008, The Cincinnati Review, The North American Review, Pleiades, and Mid-American Review, as well as the online sites for Verse Daily and the PBS News Hour's ArtBeat blog. 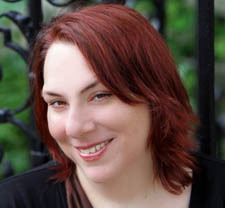 Perrier joined the faculty at Point Park University in 2008 to design and implement the creative writing major and minor. Nothing Fatal, Akron Poetry Series, Akron, Ohio, 2010. "The Queen of Snakes," The Cincinnati Review, 2010. "Too Darn Hot," Barn Owl Review, 2010. "Poor Bête Noire" and "The Apprenticeship," Bat City Review, 2009. Just One of Those Things, Wick Poetry Chapbook, Kent, Ohio, 2003. Panelist and featured reader, Annual Fall for the Book festival, Fairfax, Va., 2011. Invited readings at University of Cincinnati's Elliston Poetry Series, 2011. "The Psychology of Detail," Association of Writers and Writing Programs Conference, 2011. Duquesne University's Coffee House Reading Series, 2010. Editor's Choice, Akron Poetry Series, University of Akron Press. University Distinguished Graduate Fellowship, University of Cincinnati. William C. Boyce Teaching Award, University of Cincinnati. "Students Learn New Writing Techniques in Master Class with Poet Brittany Cavallaro," Point Park University website, April 22, 2016. "Creative Writing Alumna, West Coast Native is the Lifestyle Editor for LOCALpittsburgh," Point Park University website, Nov. 4, 2015. "Creative Writing 2015 Graduate Offered Full-Time Position Right After Graduating," Point Park University website, July 9, 2015. "Creative Writing Majors Take Master Class With Award-Winning Poet Marcus Wicker," Point Park University website, Dec. 12, 2014. "Master Classes Connect Students to Nationally Recognized Writers," Point Park University website, April 22, 2013. "Cultivating Young Writers," The Point, Fall 2012 issue. "English/Creative Writing Student Working as Copywriting Intern for the Post-Gazette," Point Park University website, July 6, 2012. "Creative Writing Workshops Allow Students to Hone Their Craft," Point Park University website, April 8, 2011.